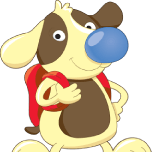 Homework Hound is about creating exceptional learning experiences for children. Every child completes set weekly activities, which inform their own individualised program, not only rewarding strengths, but developing those areas of challenge through targeted educational games and activities created by experienced teachers. Homework Hound delivers results as children discover a love of learning on the journey to realising their learning potential. We know teachers are busy. They don’t have time to spare setting up yet another new system for the classroom. That’s why we do it all for you. All we need is your class list! We will input each student’s details, set up your class account, all weekly content and forward you the access details. All you need to do is hand access cards to your students, and they’re ready to get going. It’s that simple! Experienced Australian school teachers have carefully crafted over 25 000 English and Mathematics questions. They have developed worksheets that revise concepts for any students whose results reveal a lack of understanding in a particular skillset, ensuring they have the opportunity to develop the required knowledge before any further testing is completed in that area. No two students are exactly the same, and that’s why we tailor the Homework Hound learning experience to each individual student’s needs. Worksheets are allocated to students on a needs basis, and online games are prescribed based upon the weekly results achieved in each area of the English and Mathematics content. Students can customise their portal to suit their own preferences, by changing background colours, images, adding avatars, selecting music and more. Students are able to access Homework Hound anywhere via laptop, tablet, desktop and even smart phone! We understand that all learning spaces are set up in a unique way to meet the needs of your students. Homework Hound aims to seamlessly fit into your learning environment. As long as you have access to the internet, you will be able to successfully integrate Homework Hound into your classroom. An easy-to-use, in-built reward system allows teachers and parents to add rewards for certain levels of achievement, which creates the ultimate level of motivation, encouraging students to strive for successful task completion throughout the entire school year. Detailed weekly reporting is an essential component of Homework Hound. Overall class strengths and areas of challenge are highlighted, with suggested class activities to address these needs. Parents are provided with weekly reports, which provide them with necessary feedback on their child’s progress. Results are indicated for each subject area, and additional hints and tips are provided to empower parents to help their child at home. Weekly completion certificates are provided for teachers and students to print, celebrating their greatest learning achievements this week along with identifying their greatest areas of challenge that can be addressed in future weeks. Contact our friendly team to set up a FREE trial for your class.